Inspector In-a-Box Maintenance Management is an efficient and flexible mobile management solution. Designed to replace the clipboard, this solution ensures accurate electronic data collection of high value assets within the field. It addresses data collection and manual transcription redundancy, offers bi-directional data transfer with real-time options, allows for consistent accuracy and verified analytics over time, and integrates seamlessly with pre-existing databases, providing lower entry cost and easier implementation. 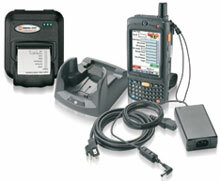 This innovative solution combined with the TracerPlus Maintenance Management software, Motorola MC75 mobile computer, and Datamax-O'Neil MF2te printer eliminates common inefficiencies and errors allowing government and commercial entities to realize a fast ROI.